Whether you are new to heat pressing/transferring or have always been a long-time fan, searching the market for a press that is durable, cost-effective, and effortless to use is harder than it seems. That’s why we’re here. Let’s check out the Transfer Craft Heat Transfer Press. It can press large items due to its sizable heat plate, it requires no assembly, and it’s extremely easy to use. All that said, we understand that no machine is perfect. Some users had this heat press malfunction and break, while others found that it grew so hot, it was transferring heat to items around it. Nonetheless, before you make your final decision, let’s take a more in-depth look at the Transfer Crafts Heat Transfer Press. Is it right for you? Product Dimensions: 27 x 18 x 14 inches. Plate Size: 15 x 15 inches. Stand-Out Feature: 15 x 15-inch plate. The heated plates on the Transfer Craft are 15 x 15 inches. This means you can make a number of different products in varying sizes. Since many presses on the market are on the smaller side and don’t allow you to press bigger items, this press stands out, equipping you with greater freedom to realize the crafts of your choice – not what your press limits you to. You can transfer images on sizable shirts, bags, puzzles, ceramic tiles, mouse pads, plates, and any other flat-surfaced object. The temperature control on this heat press is on the back base of the machine and is easily controlled with up and down arrow buttons. The temperature can be set anywhere from 0 to 500 degrees Fahrenheit. So, no matter if the item you’re pressing needs a cooler temperature or something a bit hotter, this press will have you covered. The timer can also be controlled at the back base of the press. You just have to use the up and down arrow buttons to set it, and watch the small screen above to see how much time you have left as you press. The timer can be set anywhere from 0 to 999 seconds. This makes it far easier to manage your projects and ensure nothing is overcooked, so you can streamline the entire endeavor. No need to set your own separate timer or try and guess when something is done. The press will beep when the time is up! The aluminum plates of the Transfer Crafts press are Teflon-coated, so you don’t have to worry about your image or the item you’re pressing sticking to plates. Especially if you are more of a novice to heat pressing, this will make the process smooth and error-free. Getting discouraged because you have a hard time cleaning the heat plate is never a good way to be introduced to a new hobby. With a 15 x 15 inch heating plate, this press gives you ample room to make your next creation. With other, smaller presses, you can’t tackle larger shirts or objects, but that’s not an issue thanks to this sizable capacity. It can handle everything from large shirts, big tote bags, puzzles, tiles, plates, and so much more. As long as it fits within the 15 x 15 space and is relatively flat, you can press any image you’d like! If you’re looking to upgrade your small business, or just make unique gifts for the entire family, the Transfer Crafts Heat Transfer Press won’t let you down. A fantastic positive that users have raved about is the lack of assembly required on this press. You can simply unbox it and dive into your project! There’s no need to attach components or piece together the machine’s structure. This saves users time and potential frustration from putting together a complicated machine. If you are new to heat pressing, this is an especially great feature for you, but even as a pro, who wants to invest additional work before enjoying their purchase? You can skip the complicated assembly that most presses require and get down to work. Operating the machine itself is nearly effortless. To get started, you need only plug it in and select your desired temperature. Once it reaches that heat level, the machine will beep. Lift the presser plate up, carefully place your item and the image onto the heating plate, and choose your desired pressure level on the gauge. Next, you will put the presser plate back down and set the timer for the amount of time you expect it to take. If you are a novice, there are plenty of websites out there that can help you determine the appropriate times and temperatures. Otherwise, it is really a trial and error situation. Once the timer goes off, the press will beep again. Lift up the lid and carefully remove your item. It’s that simple! This machine doesn’t come with a huge learning curve which makes it super easy to get accustomed to and teach fellow crafters. Since this Transfer Crafts heat press comes with a Teflon-coated heating element, you don’t have to worry about clean-up. A number of presses on the market either don’t include nonstick properties at all or they require you to buy Teflon sheets that must be applied each time you press an item. That’s not the case here! No need for the extra purchase or the extra worry; Transfer Crafts has you covered. Several users appreciated how sturdy the Transfer Crafts Heat Transfer Press is. At 50 pounds in weight, you can accurately guess that this isn’t some flimsy plastic machine. It’s built almost entirely of strong metal (mostly aluminum) to ensure that you’ll own it for years to come. While this may not be the best press for a large business, as it is manual and not automatic, it is great for everyday use in a hobby or if you do transfers as a side business. 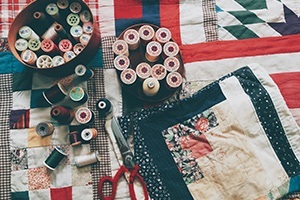 It can be daunting to spend hundreds of dollars on a new hobby before you even get started. This can deter a lot of new crafters from getting the chance to tackle the projects in their head. Fortunately, Transfer Crafts makes it easy to grow your skills thanks to its affordable price-tag. Costing under $200 on Amazon, chances are, you’ll be able to have some extra cash for fun materials and items for your projects. This is great for both beginners and crafters on a budget since you won’t be required to delve too deep into your wallets to get this machine. Since it’s so versatile, you’ll be getting a good value too! You won’t be confined to just a few materials or products with this heat press. Don’t let the price fool you though. This machine might be affordable but that doesn’t mean it does a bad job at getting the task done. As mentioned, the construction of this machine isn’t made flimsy like other cheap heat presses. This shows that the Transfer Crafts Heat Press will continue to produce quality prints even after using it for some time. A few users did have issues with the press malfunctioning after a short period. One user said they’d pressed about 20 shirts when the top plate’s alignment became skewed and the handle started to bend. While this wasn’t an issue for most testers, it’s worth mentioning. A skewed plate can be fixed and a bent handle can be lived with, but it’s unfortunate to encounter a problem at all. This is more of a warning than a true negative: A few users stated that the heat press emits a great deal of heat, and as a result, any surface around the heat press also gets very hot. So, if there is anything close to where you’re pressing that could melt or scorch easily, you may want to remove it before starting up the press. It’d be terrible to unknowingly ruin something of yours while you’re using the press, so taking this extra safety precaution could save you some worry and stress. While its weight of 50 pounds makes it a sturdy, stable choice, it also makes it a heavier one. If you’re looking for a machine that you can move and transport easily, this heat press may be cumbersome. It would be best to set a permanent or semi-permanent space for this heat press if you have trouble moving heavy items. Its weight also means this will be one of the less portable heat presses on the market. After looking over all the positives and negatives, we do recommend the Transfer Crafts Heat Transfer Press. With the ability to press so many different items of different sizes, the nonstick heating element, and how easy it is to use, this was an easy decision. It also doesn’t hurt that the press is built almost entirely of strong metal, so you won’t have to buy a new one next year. If you are into heat pressing and transferring, this is definitely a product worth checking out. Transfer Crafts isn’t exactly a famed brand, but they’ve proven their place in the crafting world with the display of their Transfer Crafts Heat Press. Customer and enthusiasts raving about this company’s product makes us all the more excited to see what else this company has up their sleeves. They’ve marketed their heat press to be easy-to-use, affordable, and accessible, making it a breeze for a variety of hobbyists to take the plunge in owning their own device for their craft. Since this seems to be a newer brand on the market, it will be hard to find the Transfer Crafts Heat Press both in-store and online. While it’s usually best to check crafting and specialty stores, you’ll be better off checking out their listing on Amazon. That’s all for our Transfer Crafts Heat Press review. Curious to give it a try? There's no doubt that this machine is versatile, easy-to-use and sturdy, perfect for beginner crafters and those with small businesses. What makes the Transfer Crafts Heat Press even better is its affordability and reliability.